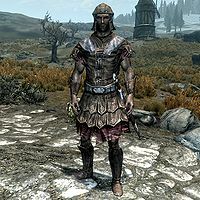 The Roadside Guard will appear in the game only if the Pale is under Imperial Legion control. This may be because you are aligned with the Imperial Legion, and captured it during the Civil War questline, or it may be transferred to the Legion during the negotiations in Season Unending. The Roadside Guard will then replace the Pale Hold Guard, and will perpetually patrol the road near Loreius Farm. He wears a set of Imperial light armor and wields an Imperial sword and bow in combat. He also carries a set of common clothes, a steel dagger and some steel arrows. If you approach him before starting the related quest, or after it has been completed, he can be found saying, "You need something?" You only have one dialogue option: "No, nothing. I'll just be moving on." The guard will reply, "Well all right, then." If you have a bounty in the Pale, then he will arrest you like any other guard. This page was last modified on 1 September 2018, at 01:50.